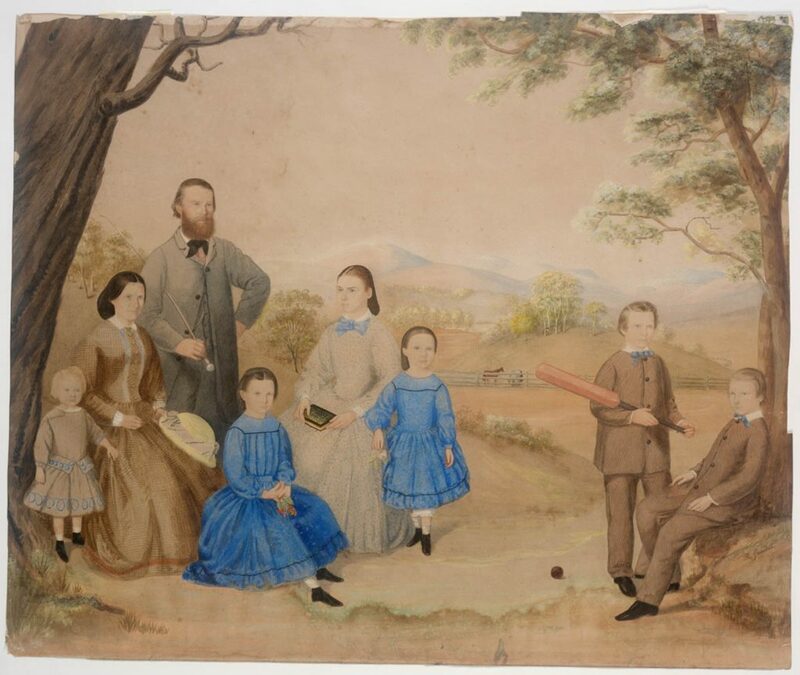 This watercolour portrait shows a colonial family, comprising an adult male and female with six children – three daughters and three sons, one holding a cricket bat – posed in a rural, pastoral setting. It is reminiscent of the type of informal group portrait known as a ‘conversation piece’ which is characterised by the depiction of a number of family members and/or friends portrayed in the act of conversation or some other activity, either in a domestic or rural setting, very often posed outdoors. This type of image is very rare in colonial art by the 1860s, as photography had largely undercut the market for formal painted portraiture except at the upper end of the market. The awkward composition of this watercolour suggests it may have been worked up from a series of individual photographic portraits. The family are all depicted wearing casual summer clothes. The youngest child, on the far left, can be determined to be a boy of about four to five years of age, as indicated by the side parting of his short brown hair. Following the practice of clothing children of both sexes in skirts until they were thoroughly toilet-trained, he wears a brown cloth dress with military-style epaulettes on the shoulder above long sleeves, trimmed with blue Russian braid in scrolling pattern at the cuffs, peplum and hem of his pleated skirt, worn with short white socks and elastic-sided boots. The mother wears a two-piece day dress of a fine, gingham-checked brown cotton, comprising a bodice jacket with a centre front button fastening, edged with bands of white lace/braid trim above a round waist, worn with a white collar and bishop sleeves with matching cuffs, and a long, full skirt with narrow red/rust braid trim marking its circumference at the hem. She holds a flat-crowned, narrow-brimmed, round straw hat with a [silk] ribbon band in her lap, her centre-parted dark hair fastened back from her face, with the remainder rolled up and tucked into a hair net, hanging down to shoulder level behind. The father smoking a long clay pipe wears a serviceable brown cloth three piece sack, or ‘sac’, suit, cut long and loose through the body with wide sleeves and small notched lapels, buttoned close to the neck and left open down the front, above a matching single-breasted waistcoat and trousers, and worn over a white shirt with a turn down collar and a black [silk] ribbon tie. His side parted reddish hair is worn long, curling behind his ears over his neck, and he is unshaven with the long, full beard and moustache popular in this period. The eldest, teenaged daughter, seated near her parents holds a book in her hand, perhaps teaching her younger sisters who stand nearby. She wears a grey beige cloth dress with a high-necked bodice, a sky blue ribbon tied in a bow below a narrow white collar, and moderate bishop sleeves with matching white cuffs above a long full skirt with a round waist. The two younger girls wear matching sky blue cloth dresses with round-necked square yokes, edged with black piping above pleated bodices with long ‘bishop’ sleeves, and round waists marked by self-fabric belts above knee-length full skirts trimmed with a single flounce at the hem also piped in black. Both girls wear white stockings and elastic-sided black leather ankle boots, the younger girl’s pantalettes just visible below the hem of her dress. The elder two boys wear collarless schoolboy suits, buttoned to the neck over white shirts with turn down collars and soft sky blue [silk] bow ties, worn with matching long trousers and elastic-sided black leather boots. Both boys wear their short hair brushed into a curled wave at the temple from a side parting. One boy holds a cricket bat with a ball at his feet. R. Grindell is thought to have been an itinerant artist who travelled around New South Wales in the 1860s painting watercolours of homesteads and landscape views. Recollected as a ‘gentleman swaggie’ by a descendant of one of his clients, Grindell may have been a son of James Grindell who was in New Zealand from the 1840s, working successively as explorer, settler, hotel proprietor and government interpreter (from 1848). In about 1863, Grindell was at Henry and Harriette Wallace’s property, Eunonyhareenyha at Wagga Wagga, where he produced a set of three watercolour and gouache views signed ‘R. Grindell pinx’; all three works remain with the family for whom they were painted.